Polish electronic music flagship Transatlantyk return with a brand new release. Warsaw's Mchy I Popsty following up an excellent debut for Brutaz back in 2017. "Ravage" kicks things off, utilizing the old Russion synthesizers and placing a fizzing bassline over suspended pads and broken drum machines for a leftfield jack track that bites at the balls. 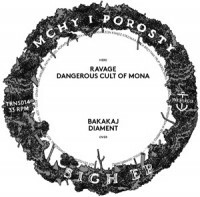 "Dangerous Cult Of Mona" places a pitched down vocal refrain over a slamming kick and a sparse, plotted synth hook. It's discordant yet epic nature lends itself to damaging the bigger stages on the underground circuit. Side B's "Bakakaj" keeps with the discordant nature and adds a whole lot of percussive chaos as a series of clattering drum passages converges on the mix alongside reversed SFX and dark low strings hiding within the recesses. "Diament" thankfully switches to something more harmonious before the record's completion; adopting a new electro type feel and playing out some luxurious synth passages and soft, playful drum programming. Ear catching in parts, inventive in others, excellent work here from the POlish producer. Sil says: The analogue spirit is all over this vinyl. Rave is also an appropriate word here. But it is that delicate roughness that makes it exceptional. Very much what you would like to listen to at 4am in a truly underground party.